Before I even set foot in the vast, rugged Helen W. Buckner Nature Preserve in West Haven, the act of traveling there provided a humbling lesson. Tucked into a jagged cartographical outcropping in west-central Vermont, the enormous preserve is bounded by insurmountable geological features that force visiting Vermonters to cross into New York State before doubling back to enter the wilderness. These navigational shenanigans illustrate that state borders are largely arbitrary, and that mountains and rivers are no places for roads. Valleys are good places for roads, though, and Route 22A, rippling through the Champlain Valley, took me past hundreds of hay bales, millions of leaves about to ignite with fall color and Fair Haven's incongruous Devil's Bowl Speedway. I was headed to the Buckner Preserve at the suggestion of Sara Zahendra, a field biologist with the Vermont Center for Ecostudies, who calls the site her "favorite place in Vermont." Zahendra and Murray McHugh, critical lands manager at the southern office of the Nature Conservancy of Vermont, met me there. In our email exchanges, Zahendra talked up the Buckner Preserve with zeal, referring to geology, flora and fauna that exist nowhere else in Vermont. As a biologist and cohost of Vermont Public Radio's "Outdoor Radio," she knows her stuff. Several episodes of the show are set in the preserve, which is the most ecologically diverse area in Vermont under the Nature Conservancy's stewardship. 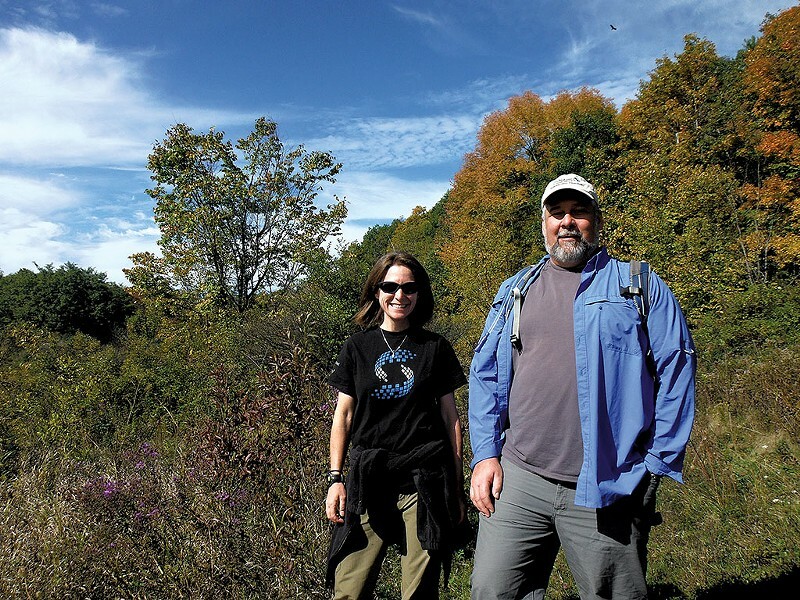 Kiosks inform hikers that Buckner is home to birds such as whip-poor-wills and the rarely seen peregrine falcon; an abundance of frogs and salamanders; and Vermont's only lizard species, the five-lined skink. More dramatically — and, to me, surprisingly — the wooded expanse is also at the northern edge of the venomous eastern timber rattlesnake's habitat. These snakes typically commence their hibernation in early fall, so spotting a rattler seemed unlikely. But the day was warm, so it wasn't impossible that we'd see one taking its last sunbath of the season. McHugh explained that rattlesnakes used to be more common in Vermont, but their unfortunate reputation worked against them. Until 1979, local snake trappers could exchange the snakes' heads and rattles for a bounty. Now, the reptiles here face extirpation of a different kind: a fungal disease similar to the one that has decimated North American bat populations. "Biologists are very concerned," McHugh said, confirming that the condition has been found in the local rattler population. 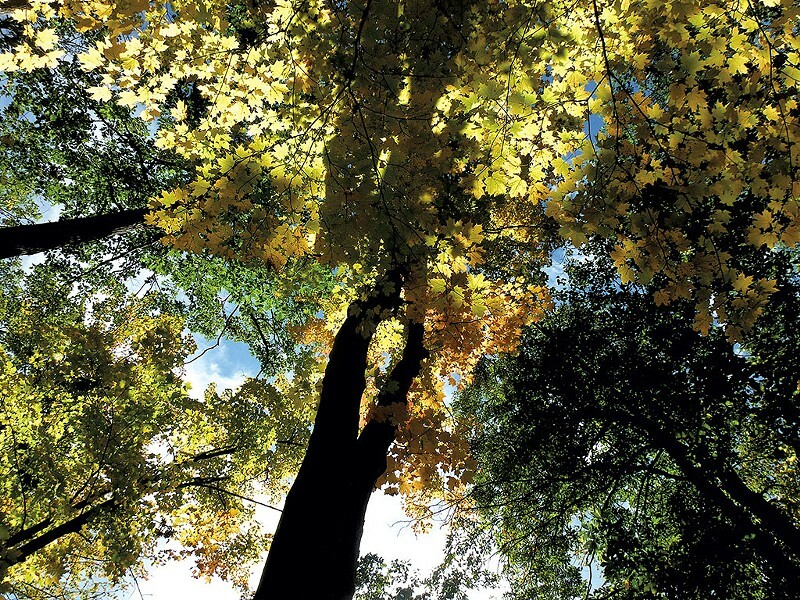 The moment when summer turns to fall is a bittersweet time to visit this — or any — wild habitat; signs of decay were plentiful. Most wildflowers were reduced to sere stalks; only the vividly purple, late-blooming asters enlivened the edges of the preserve's vast fields. A month ago, those fields teemed with insects; at this point, the butterflies were so few as to seem like interlopers. On spotting a ragged bee that was plainly near its last buzz, Zahendra sighed and said, "Not much longer in their lifetimes." There is an advantage to visiting in early fall: We saw only one other person, one of the preserve's residential caretakers. Even on a busier summer day, though, it would be easy to find an unpeopled spot within the preserve's almost entirely undeveloped 3,791 acres. That's about six square miles of meadows, ponds, rocky cliffs, marshes, and a forest dominated by white and red oak, hickory, and hop hornbeam. The adjacent Lower Poultney River Preserve contributes another 2,250 acres across two states to form a natural expanse of more than nine square miles. About half the land in the Buckner Preserve was once owned by a single family — the Galicks — who purchased a 1,500-acre tract in 1918. There, they hunted, trapped and farmed, moving their goods to Whitehall by boats that plied the Lower Poultney River and the southern edge of Lake Champlain. In 1934, the Galicks undertook the enormous task of constructing, with a steam shovel and uncommon determination, a trade road. The ghost of that old road appears intermittently, in areas where the trees are a little shorter. The family sold the land in 1989 to the Nature Conservancy, which erected plaques in their name. 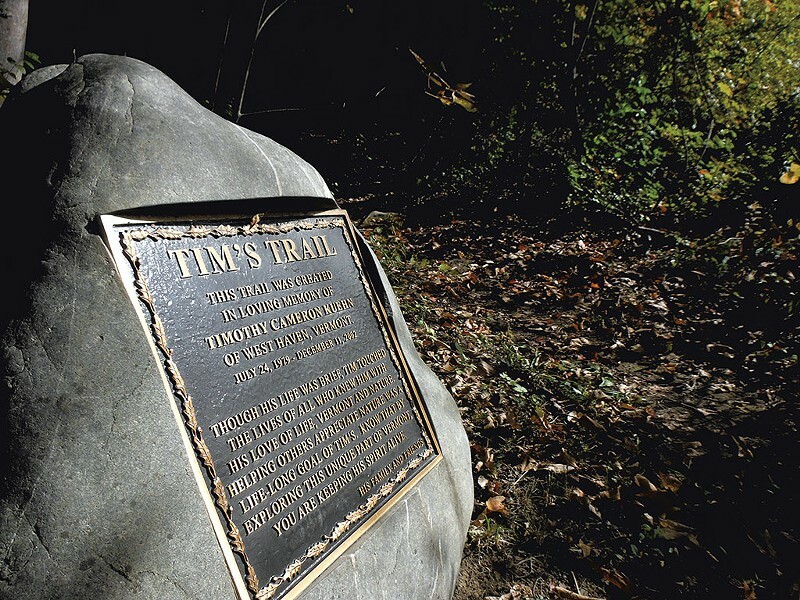 A hike along Tim's Trail — named for late nature enthusiast Timothy Kuehn — revealed several other plaque-like objects, as well. Biologists have placed numbered slabs of slate, called cover boards, throughout the preserve. Each measures about 2 by 3 feet. Propped up at one end just enough to grant reptilian access, the slabs are effectively solar panels that provide the warm niches that snakes favor. They also help the scientists get a sense of the size and health of the local snake population. I stood with camera at the ready as McHugh lifted several of these panels, but there were no rattlers. The only slithering we saw was that of a lone garter snake, harmless but for the stinky, cloacal musk it defensively exuded onto my hand. 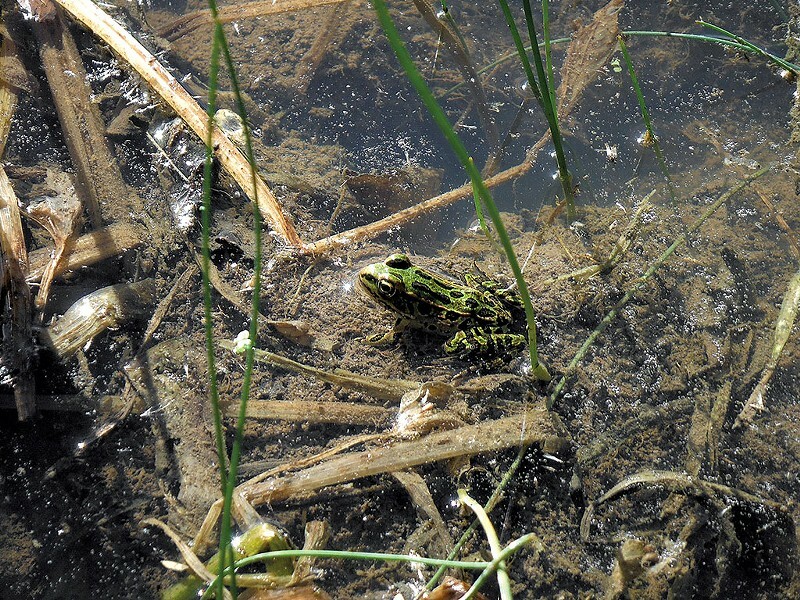 Northern leopard frogs were in greater abundance, bouncing through the still-warmish waters at the edges of ponds and marshes. For the same reason they like sun-warmed slabs, the local reptiles prefer to spend much of their time within the preserve's most distinctive geological features. The stark cliff faces consist chiefly of quartz, feldspar, gneiss and mica, the last of which is sufficiently soft to foster frequent crumbling. The resulting dramatic clusters of large, blocky rocks, called talus slopes, provide the shaded nooks and sunny surfaces that are essential to the reptile lifestyle. If it's rattlesnakes you seek, these talus slopes are Vermont's ground zero. In the woods, other animals make their presence known, even if the creatures themselves are hard to spot. The beaver dams jutting up from the marshes were easy to see, but, without McHugh's insights, my untrained eye wouldn't have picked up on other signs of animal activity. He pointed out a branch that floated just a few feet from one of the dams; its greenness indicated recent activity; its location, the beaver's regular aquatic route. McHugh drew my attention to a slope abutting the marsh, where many felled trees bore telltale gnaw marks — the beavers' preferred lumber mill. Larger critters frequent the preserve, too. "One of the projects we're working on, as a partnership with Canada and the New England states," said McHugh, "is a corridor for large mammals to pass. Turns out that, on top of all the biodiversity you find here, this is a corridor for large mammals: moose, bear, bobcats." Before pausing to eat lunch by the side of the unpaved access road, Zahendra, McHugh and I visited another striking topological feature of the preserve. A short hike in the shadow of Bald Mountain brought us through rolling, milkweed-covered meadows. These fields are so vast, and so distinct from the cliffs, marshes and forests, that it was hard to believe they are so near. 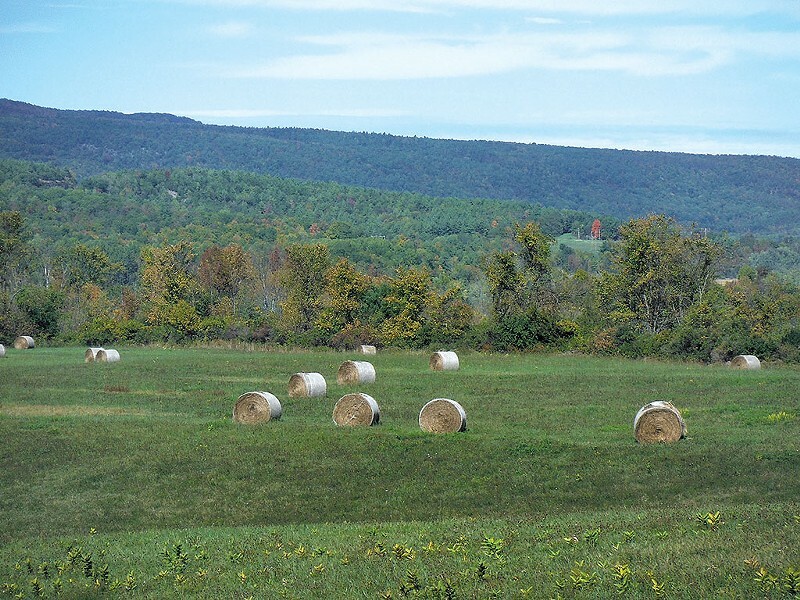 Local farmers have an arrangement with the Nature Conservancy to harvest and sell hay from the meadows, and the cylindrical bales scattered about the fields were country-store picturesque. For its remarkable diversity, the preserve is one of the Nature Conservancy's flagship territories, according to McHugh, and the organization is working on ways to attract more visitors. That's a double-edged sword, he acknowledged — a fact confirmed by the empty cans of Bud Ice and improvised fire pits we saw along the roadside. Even worse, said McHugh, "A fellow in Vermont paid someone to take a truckload of garbage to the transfer station. To save money, the guy brought it out here and lit it on fire. He actually started a wildfire, and it burned all the way up the hill." The miscreant was caught, but the damage had been done. Driving home, as I retraced my circuitous path out of the preserve, I considered once more the near randomness with which humankind has attempted to impose order on the natural world. The concept of a state line is meaningless to a garter snake or an ash tree or a river. The roundabout route was a minor inconvenience, but I really couldn't complain. The mere fact that I could hop in a car and visit the Buckner Preserve was incredible. Long before there were roads and gas stations and farm stands, every single place in that mapless world was a wilderness akin to the preserve. If frustrating human access is the way to keep it wild, that seems a fair trade-off to me. The original print version of this article was headlined "Into the Wild"